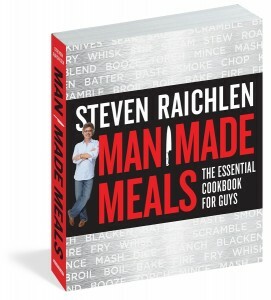 Welcome back to our latest series on BarbecueBible.com—Food Dudes—featuring interviews with the movers and shakers of the food world, excerpted from Man Made Meals: The Essential Cookbook for Guys. 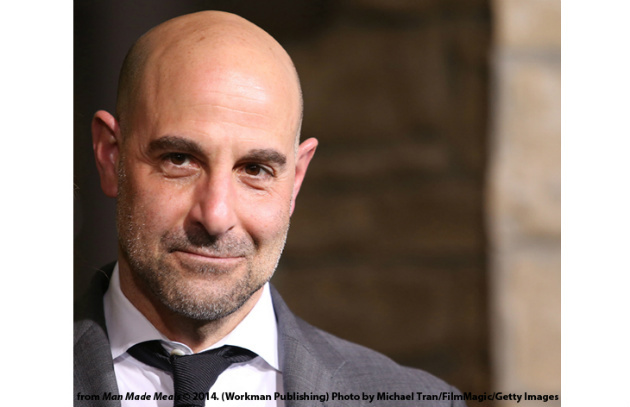 Today we bring you Stanley Tucci, who is not only an award-winning actor, screenwriter, and director, but also author of The Tucci Cookbook and host of the PBS wine tasting show Vine Talk. “I’m completely food-obsessed,” says Tucci, who attributes his passion for cooking and eating to his parents and his grandparents, who were born in Calabria, Italy. “We didn’t eat out much because we never had any money. We always sat down to a home-cooked dinner.” It was only when friends came over that Stanley realized that not everyone in 1960s America sat down to made-from-scratch meatballs with homemade ragu. Do men and women cook differently? Men make more of a show of it. What’s your favorite seduction dish? Risotto. It takes a long time, so you can talk while you’re making it. It takes care and attention to detail, and you can show the lady you have good hands. Three dishes every guy should know how to make? Paella. I learned to make it in the mountains in Majorca, Spain, where we were shooting a movie. We cooked it outside over a wood fire. It’s a lot of work, but I like a dish that’s a lot of work. The harder it is to make it, the more satisfying it is when you succeed. Rabbit. Underutilized, but it’s delicious. One dish really worthy of attention and connoisseurship? Timpano. It’s this incredibly complicated pasta dish from my grandparents’ village, Serra San Bruno, in Calabria, Italy. It takes a whole day to make, and there are, perhaps, three men in all of North America who know how to make it—my dad, my cousin, and me. You start by making a dough that’s a cross between pasta and pizza dough. You use it to line a drum-shaped basin and fill it with homemade ziti, hard-boiled eggs, Romano and provolone cheese, ham, Genoa salami, marinara sauce, and these tiny homemade meatballs. You bake it, let it sit, and invert it, and if all stars are aligned, when you cut into it you see all these beautiful striations and layers of genius. Three ingredients you can’t live without? Eggs, rice, and wine. Eggs are the protein; rice the starch; and wine you can mix with both. Three tools you can’t live without? A cast-iron skillet. You can cook with it on the stove and in the oven. My grill. I’ve been through four. My fiancée gave me a grill when we got engaged. Talk about the way to a man’s heart. My wood-burning pizza oven. I fire it up at noon so it’s ready for dinner. You have to tear me away from it. Read the full interview in Man Made Meals.